After our first stay-cation with G&G in last December, the itch to do another one hit us again. This time, we decided to do a resort-style staycation, getting away from the buzzy city. Obviously, there aren’t many choice locations in Singapore to have an Away-from-City getaway and Sentosa became an indisputable choice. 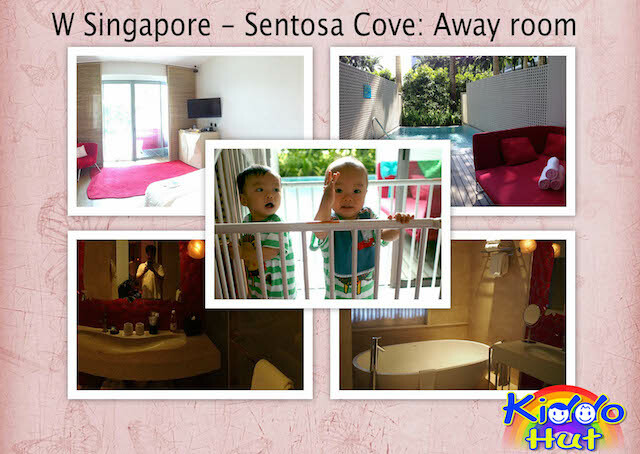 After much research, we settled on our top 2 choices of hotels that could possibly offer us the getaway-from-City-with-resort-feel experiences – Staycation at W Sentosa – Sentosa Cove (“W”)’s Away room and Movenpick Heritage Hotel’s Onsen room. Apart from adding varieties to our staycation, we simply cannot decide on a winner among our top 2 shortlisted hotels for this time, we decided to go for a no-brainer decision for our 5 Days 4 Nights staycation. We picked W for its seclusiveness location. It is located at the far end of Sentosa, sitting beside one of the most prominent private properties’ addresses in Singapore – Sentosa Cove. The vicinity gives a tranquility feeling especially during week days. W overlooks the Oneº 15’s marina. Looking at the boats reminded me that my power pleasure craft license is still collecting dusts in my cupboard. It has been years since I last stepped onto a Keel boat. We like the amenities of the surrounding which are all within walking distance (within 15 minutes by foot), there are two supermarkets and a stretch of eateries along the quayside isle just beside the hotel. After dinner, we would stroll along the waterfront enjoying the evening breeze with the equanimity of the water accompanying by the picturesque view of the sunset casting onto the yachts. W has thrilled us with their more than 1,300 sq’m huge swimming pool although we could only stick to the baby pool that is 0.3m high which G&G has enjoyed playing in it on our second day of stay. The hotel has other amenities like gym and spa facilities which we didn’t manage to utilise it. The gym has a line of treadmills which are pretty under-utilised. If half of it could be converted to an indoor play area for tots, I think it could be more well-received. We were impressed by the customer service of the hotel. The response time to any of our request was barely 5 minutes. To a family with twins tots, we need speed in everything and we liked the sense of urgency this hotel’s staff has. Upon arrival, we were asked if we need a baby cot and we got it almost immediately after we stepped into our room. The concierge staff was very prompt at receiving us and our sleeping tots at the moment our car stopped at the front door. We were checked-in without much fuss, and our luggages and bags were sent to our room even before we reached our room. W has given gone to the extent of providing a set of baby toiletries automatically. The entrance to the Away rooms is accessed from the hotel’s spa area, which gives a more discreet feeling. Our objective for this stay-cation is a resort getaway, hence we picked the Away room at W whereby the air-conditioned room is extended with an outside terrace that comes with a day bed and an adjoining 0.9m plunge pool. The room was splendid and G&G simply loved the plunge pool, they were elated as this was their first swim in an outdoor pool. Notwithstanding, for families with young kids, we need to keep a constant eye on our little ones when the door to the outdoor terrace is open. With a pool within the room, we had the convenience of being able to bath G&G right after their swim. Our room has a huge bathtub in a spacious the bathroom. Beside a bath tub, we have a choice of a separate standing shower which many hotels simply combine the standing shower with the bath tub, which kinda of irked me always. The breakfast spread in W has good varieties, and part of their menu changes daily. On our second day of stay, we noticed that the hotel has checked-in many Indian guests and the very next day, there was a spread of Indian food. Seemingly a hotel that is sensitive to its customers’ gastronomy requirements. However, we weren’t too pleased with their high chairs in the restaurant which definitely need to be replaced, at least for the cushioning as well as additional cleaning. Apart from breakkie, worth mentioning is their welcome drinks, which gave good selection from their drink menu including cocktails and mock-tails. At least, I am not expecting to have one standard beverage. I love choices and choices that could tease my taste buds. We didn’t manage to dine at the Skirt restaurant, apparently only children above 8 years old are welcome! In addition, W provides shutter bus to Vivo City as well, in case you would like to do some shopping! There is a within Sentosa Island bus that stops at W too. So, it is convenient to stay at W even though you do not drive. Overall, our 3 Days 2 Nights staying experience with W was excellent. Our experience could be heightened if the hotel has some amenities for young children. In my opinion, this hotel is suitable for families and couples looking for a short getaway from city life. 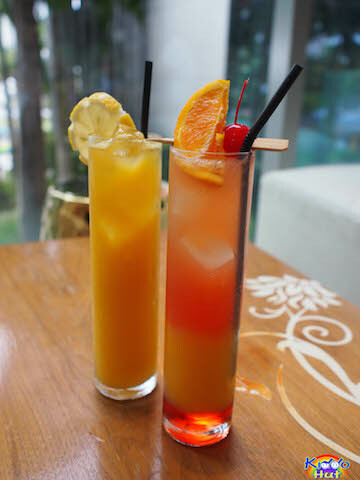 We continued our staycation with Movenpick Heritage Sentosa Hotel. Review for this hotel is in my next post – Staycation @ Movenpick Sentosa. To read it now, please click here.